HEMET, Calif. (AP) — The tense atmosphere surrounding a California police department plagued by booby trap attacks has been stepped up a notch following the latest threat against officers. Someone called 911 at about 5:45 p.m. Friday saying a police car would be blown up in the Hemet-San Jacinto area in the next 24 to 48 hours, Hemet Police Chief Richard Dana said. "We're heightening the alert," Dana told The Press-Enterprise. The caller said the attack would be in retaliation for the law enforcement sweep against the Vagos Motorcycle Club earlier this week. The Riverside County Sheriff's Department has not been able to confirm the threat, Deputy Herlinda Valenzuela said. About 30 members of the Vagos, California's largest motorcycle gang, were arrested in Riverside County on Wednesday, as part of a crackdown across the state and in Arizona, Nevada and Utah. The gang specializes in methamphetamine sales, identity theft and violence, Riverside County sheriff's Capt. Walter Meyer said. Dana said someone he believes may have been a gang member tried to get into a news conference Thursday at the district attorney's office in Riverside. The person was turned away, he said, because he didn't have a press credential. At that news conference, Dana, District Attorney Rod Pacheco, state Attorney General Brown and others announced a $200,000 reward for information leading to the arrest and conviction of those responsible for the Hemet-area booby traps aimed at officers in recent weeks. 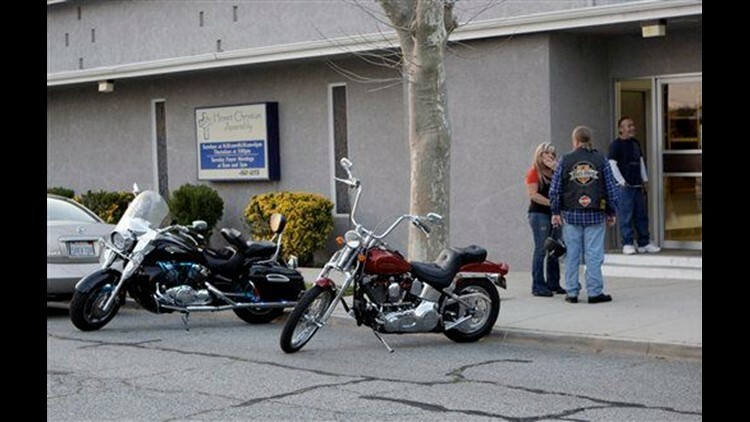 A prevalent theory for the attacks is that Vagos members were angered when members of Hemet's anti-gang task force monitored them at a funeral in a church opposite the task force's former headquarters. "I would call the mood tense," Capt. Tony Marghis said. "Everyone is being very vigilant about their surroundings and the environment."